This is the update regarding Suvendu's treatment. 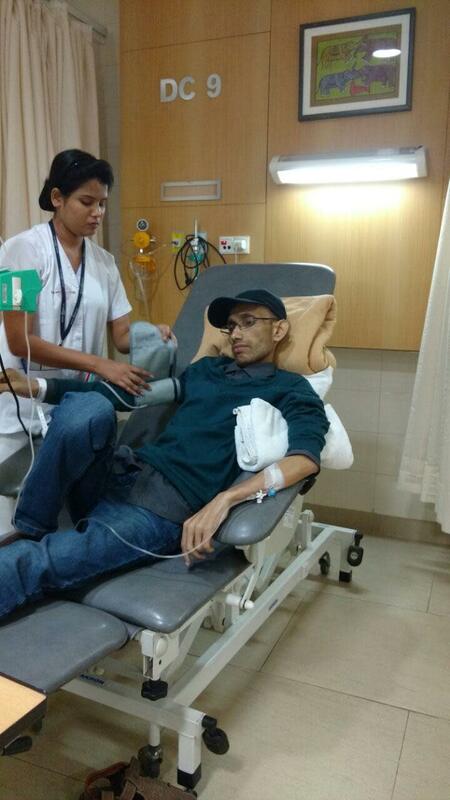 on 7th April he has finished his 5th sitting of chemotherapy. Due to extreme weakness, he is not able to talk properly. After a gap of 15 days, he will go through chemotherapy again for another 5 sittings. Friends, we need your help to gather as many contributions as possible. Kindly keep contributing for the cause. I will be keep updating this space with details. God bless you all. First of all, I would like to thank each of you for your unconditional support and prayer. Suvendu has received his first chemotherapy session at TMC on 10- 03-2017. Since the body weight is only 37 Kg he is not able to take the complete chemo once at a time. So the doctor has advised to take one complete chemo in three parts. Due to the effect of chemo now he is feeling very weak and completely bedridden. The next session is on 17-03-2017. Please keep praying for him and spread the word among your near and dear one's to contribute so that we can reach our goal. I will be posting further updates once we consult doctor again.